Armoured Drives expert team of driveway installers can create a wide rang of driveways, pathways and patios using imprinted concrete. 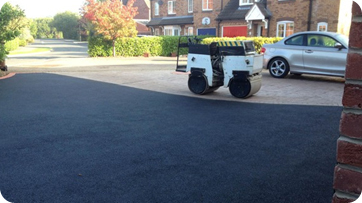 If you are looking for imprinted concrete in Nottingham, then Armoured Drives should be the first choice on your list. Imprinted concrete is made through the process of using a special concrete mix for the base, with a dry shake colour hardener floated onto the surface. Once hardened, the concrete is then imprinted with texture mats, which allow for a range of stunning designs. This technique is perfect for high traffic areas. Using this method, we can simulate the look of cobbles, brick, slate, tile or stone, and have created hundreds of unique and bespoke imprinted concrete driveways across Nottinghamshire and Derbyshire. No matter the design needed, we can use imprinted concrete to transform your driveway or patio. We are fully insured, never use subcontractors and offer a 14 day cooling off period. If you are interested in pattern imprinted concrete in Nottingham and Derby, call 0800 696 5195 or use our contact form today to find out more about our services.